If you’re new to the art, you’re probably wondering how to choose the best smoker. There are a lot of options out there and if you don’t have a lot of experience, it can get kind of confusing. That’s why we researched the top-selling, best-rated products out there and put together this list of the top smokers for beginners. Before we get into our product reviews, let’s take a look at some of the key features to keep in mind. Racks: This is how many separate racks there are for smoking. The designs vary from one smoker to the next but some of the racks are permanent and others are removable. The number we gave you includes all of them. Digital Controls: Digital controls are really nice and easy to use but they’re not completely necessary for successful smoking. Some people love the simplicity of them while others like learning more hands-on methods of temperature control. It’s totally up to you! Type: There are 2 different types of smokers, gas and electric. Electric smokers are pretty straightforward. Most can be plugged into any standard outlet. Gas smokers are usually set up for propane but it is sometimes possible to convert them to natural gas. Weight: Weight is something you should take into consideration if you’re planning to move your smoker between uses. Our picks range weight from 23 to 90 pounds so you have a lot of options to choose from. Size: Size is particularly important if you don’t have a lot of outdoor space. The good news is most of these designs have small footprints so you can still smoke a lot of meat as long as you have enough vertical space. Warranty: Warranties are always important but with products like this, you should really pay attention to the fine print. All of these products are covered but the length of the coverage varies from 90 days to 3 years. Now that you know a little more about what to look for in a smoker, let’s move into our reviews. If you’re in a hurry, check out our top and budget picks first. That’s the best way to get an idea of the range that’s available. They’re right at the top of the list so they’re really easy to find. Stick around a little longer if you can. All of these products are awesome and you never know which one will work for you. Okay, let’s get to it. When it comes to bbq smoking for beginners, the Bradley 4-Rack Smoker is our top pick. The powder epoxy steel exterior and polished stainless steel interior are super durable and really easy to clean. 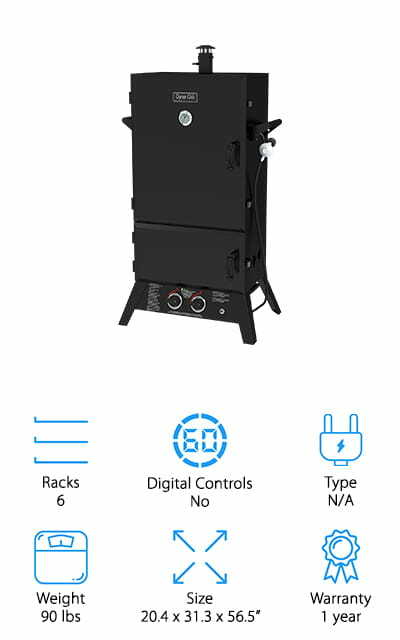 It features a digital control for temperature, time, and smoke adjustment and delivers up to 8 hours of controlled cool smoke at temperatures up to 320 degrees F. The best thing about this one is that it’s just so easy to use. Just add the right amount of charcoal, set the temperature and smoke time, and wait. That’s it! It works with any kind of meat, too. Chicken, pork, fish, beef, you name it! There are 4 racks in all and each has 143 square inches of cooking space so you can smoke a lot of meat all at once. Our budget pick is the Camp Chef Smoker. This is a great size to get you started and is multipurpose so you’ll get a lot of use out of it. It features 2 adjustable smoke racks, each with a 210 square inch cooking surface. 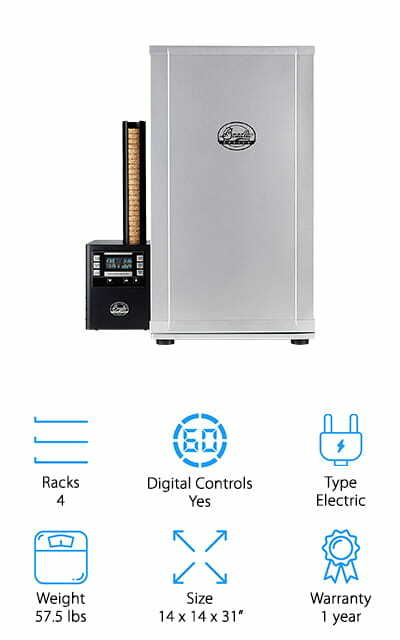 There are 3 adjustable damper valves, fully adjustable heat-control dials, and an easy-to-read door thermometer that give you a lot of control over the internal temperature, from 50 to 550 degrees F. There’s also a heavy-gauge steel wood chip tray and water pan that creates smoke to keep the meat nice and moist. If you’re brand new to this style of cooking, there are plenty of cooking tips and recipes included. This machine is set up to run on propane but can be converted to natural gas. Next up is the Masterbuilt 20071117 Electric Smoker. It comes with 4 chrome-coated cooking racks for a total of 730 square inches of cook space and it can hold up to 80 pounds of food in all. One of the things that makes it so easy to use is the side wood chip loading system that lets you add more chips without opening the door and letting the heat and smoke escape. That’s not all, there’s also a digital panel that adjusts the power, temperature, and timer. The integrated thermostat and adjustable air damper allow for consistency and smoke control plus the body is fully insulated to maintain temperatures for even cooking. Clean up is easy, too, just remove the cooking racks and drip pan and wipe clean. When it comes to good smokers for beginners, we have to recommend the Southern Country Smoker. It has 2 plated cooking grids for a total of 351 square inches of cooking space overall and plugs into any standard household outlet. The chimney-like design features a loose-fitting vented lid and tight-fitting doors to create a constant flow of new smoke for consistent, delicious flavor. Inside, there’s an extra-large 5.5-quart water pan that’s perfect for slow-cooking. Adding more water and wood chips is really easy, too, thanks to the heat-resistant wooden side and hood handles and side access door. Here’s the kicker. This base and body lock together for easy transport and makes it so you can easily convert this smoker to a simple lock and go grill. 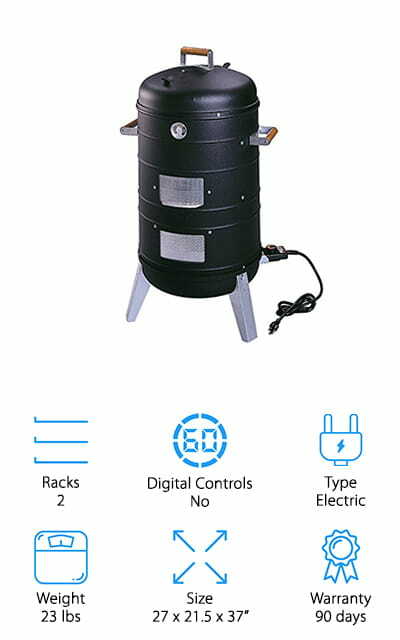 Our next pick for best meat smokers for beginners is the Old Smokey Electric Smoker. One of the best things about the design is the flat top. It allows the steam and moisture to drip right back down onto the meat. Essentially, it’s constantly basting it with delicious, concentrated flavors. 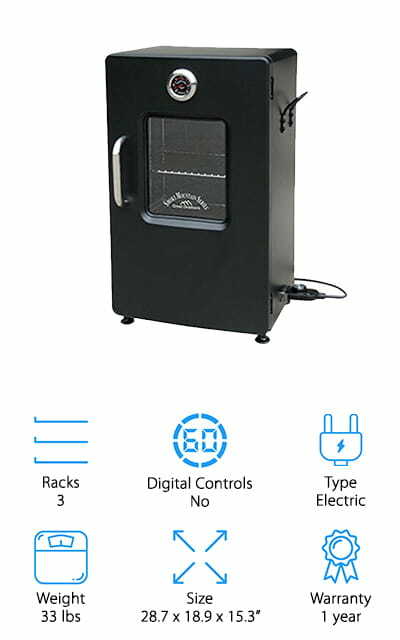 Temperature is controlled with an integrated heat thermostat and the chip tray sits right on top of the heating element to ensure maximum smoke flavor. 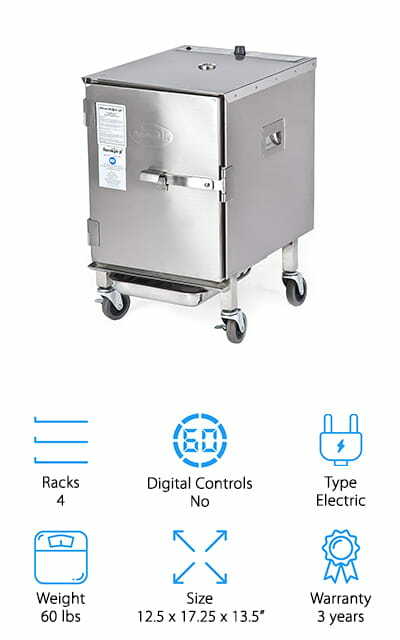 There are 2 cooking racks included as well as a drip pan, smoking chips, and carrying handles for easy transport and storage. The body is made of aluminized steel that’s lightweight, durable, and easy to wipe clean. The manufacturer recommends using this machine without an extension cord but the 5-foot long cord plugs directly into any standard outdoor outlet. The Dyna-Glo Gas Smoker is a really good choice if you want to be able to smoke a lot of meat at ones. With 6 adjustable cooking grates, you have a total of 1,904 square inches of cooking space. 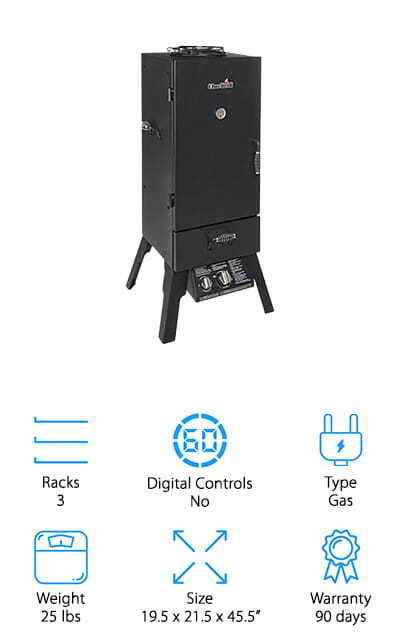 This is a vertical smoker so you have a lot of space to adjust the racks, too, to smoke thicker slabs of meat or even hang sausages vertically with the right setup. The water bowl and wood chip box are made of porcelain enameled steel and large enough to support hours of maintenance free cooking. When you do need to add more, the double door design prevents heat and smoke from escaping. There’s even a temperature gauge that displays an ideal “smoke zone” so you can get the best possible flavor. Next up in our list of best smokers for beginners is the Cuisinart COS-244 Propane Smoker. This is a gas powered design that includes a 40-inch hose and regulator that’s set up for propane but can be converted for natural gas if necessary. This smoker has a tall design that provides a lot of vertical space without having a large footprint. It comes with 4 large stainless steel shelves with a total of 784 square inches of cooking area and the 2 large doors provide easy access when you need it and seal tightly closed when it’s time to smoke. We also really like that the vent is on the back of the smoker instead of on the top so you can use it as a tabletop space for accessories and supplies. 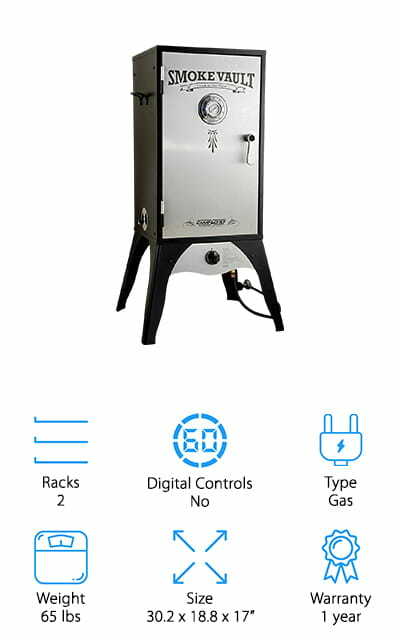 Another great electric option is the Landmann Smoky Mountain Smoker which provides 443 square inches of smoking area with a total of 3 chrome plated cooking grids. One of the best things about this design is something that you don’t see very often. There’s a viewing window in the front so you can look in and check the progress! The 3-in-1 tray is unique, too. It holds water, wood chips, and a grease collection tray. 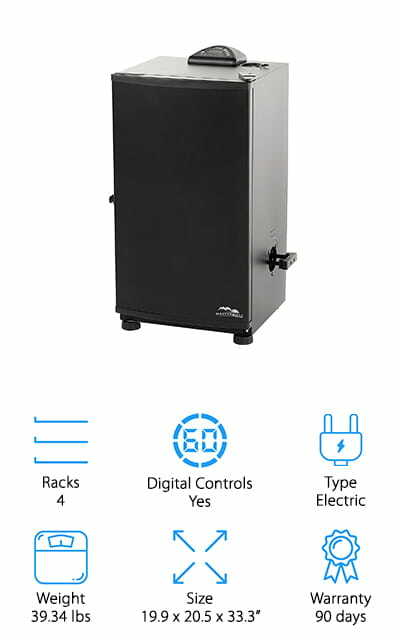 The temperature is controlled with an independent plug-in controller to maintain consistency throughout the smoking process. It has a temperature range of 100 to 260 degrees, perfect for the most common smoking applications. One more thing that we really like about this design is that the feet are adjustable so you can it up on uneven surfaces. The Smokin-It Electric Smoker has a total of 4 stainless steel cooking racks, 3 of them are removable. This smoker can hold a total of 22 pounds of meat and has a drip pan that slides underneath to facilitate easy cleanup. There’s also an easy-to-use temperature control that ranges from 100 to 250 degrees F. Something unique to this design are the 3-inch rubber casters and side handles. They make it really easy to move. The 12-foot power cord is really convenient, too. 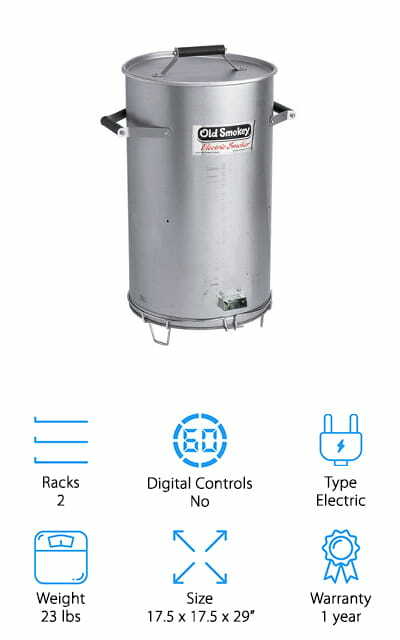 This smoker is made of strong 18 gauge stainless steel and is NSF certified for restaurant use. What does that mean for you? It’s really durable and built to last a really long time. In fact, it has one of the best warranties of all the products we looked at. Our last pick is the Char-Broil Gas Smoker. This is a great gas-powered smoker that uses propane. It has 3 chrome-plated cooking grates for a total of 595 square inches of cooking surface as well as a warming rack on the top of the smoking chamber. The double drawer design gives you easy access to the porcelain wood chip and water pan without losing any heat or smoke from inside the chamber. 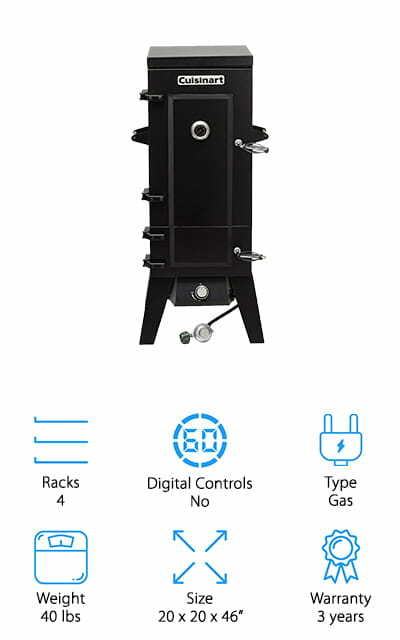 This smoker also has dual-temperature controls. The burner itself has a temperature control to heat the water and wood chips and the cooking chamber itself has a separate temperature gauge. One more thing, there’s also a convenient grate on top that’s perfect for warming sauces or marinades while you wait for your meat to finish up.